Wild and wacky ideas for parlour and stage from a unique mind! This is Volume 2 to Leaping Lizards' series of books that showcase creative thinking and magical inspiration from Dean Montalbano's younger years. Between the late 80's and early 90's, Dean created and released hundreds of ideas totally thousands of pages of ideas to various magic publications such as Tops, Genii, Magigram, MUM, Linking Ring, Invocation, Vibrations and more... His ideas have appeared in print over and over, but many of them have been unavailable and unseen for many years. Back when Leaping Lizards Magic started, some of these ideas were released in the limited edition, now out of print books Quietus of Creativity 1 and 2, and there is no plan to re-release that material at this time. However, there is still over 2 thousand pages of additional material, and so, Leaping Lizards began with this new series, to welcome you into the mind of a creative mad man. Most of these ideas are presented with emphasis on the presentations, mysterious, theatrical, sometimes corny- this second volume focuses on a series small stage and parlor effects that are geared toward family and younger audiences. In some cases, they are based upon standard effects and so the method is covered in brief- but usually these are well known items. In cases where more details may be needed, the methods have been expanded and enhanced with needed illustrations. Are you a fan of the old style of Supreme Plaque Magic? Do you do kid and family type shows that are as much about color, fun and laughs as they are about amazement? Do you like things that are just a little off beat and sometimes corny? 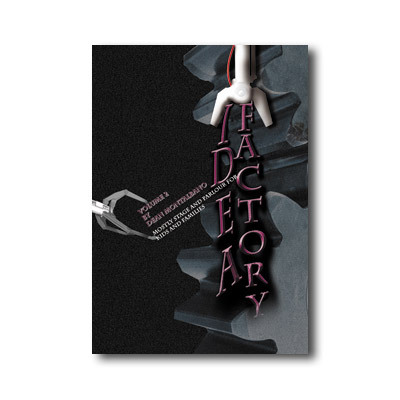 Did you enjoy Idea Factory Volume 1? Well... then this book is for YOU! Following the format of Idea Factory Volume 1, Leaping Lizards is pleased to offer you volume 2 in this series. About a 50 50 split of children's and family type magic, this book focuses more on presentation and premise than method- and opts to keep the HOW as simple as possible, which still having an element of mystery and surprise. Effects like Bunny Pate- where you smoosh and reproduce your rabbit friend, but not without accidently flattening your own hand to a cartoonish pancake. Send In The Clowns- a kids effect where a clown's makeup is removed and vanished only to reappear where it started along with a big surprise finale and awesome way to lead in to 20th century silks or Sympathetic silks for a children's audience. In Houdini Goes To The Dump, you escape from a large trash can- a one person comedy escape illusion! Some other titles: The Adventures of Bart Bunny, A Well Balanced Breakfast, The Goose Is Getting Fat, Oh No, Not Another Squaring The Circle!, The Hills Are Alive, With The Sound Of Knish, The Luck Of The Irish (A St Patty's day Ultissimo variant), A Apple A Day Could Kill You, NO NO NINTENDO! There are tricks with CDs, Ties, Potatoes, watches, razor blades, real rabbits, fake rabbits, stainless steel squares that mutate and bend!